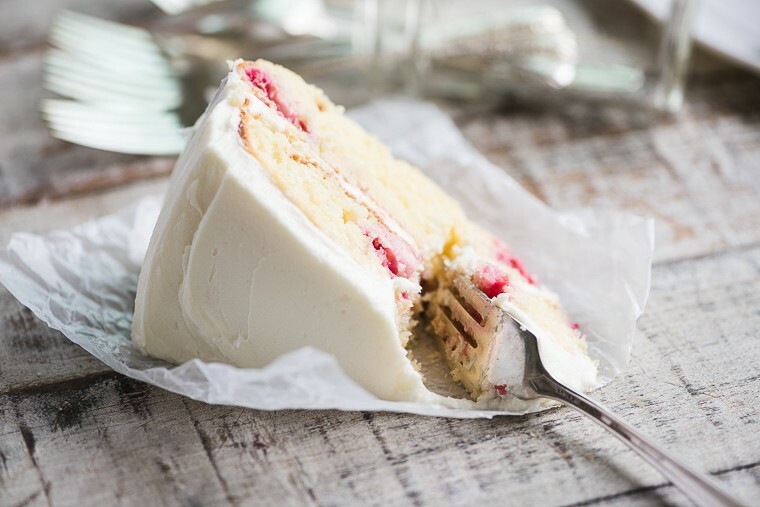 My Raspberry Lemon Tea Cake recipe is a layer cake made with yogurt, fresh raspberries, and a fresh lemon buttercream frosting. Preheat oven to 350F Butter and flour 2 non-stick 9 inch cake pans (you can use 8 inch pans, as well, just increase the cooking time.) I like to put a round of parchment paper on the bottom of the pans just to insure a good release. Cream the butter and sugar together until light and fluffy, scraping down the sides of the bowl as necessary. Beat in the egg yolks, one at a time. In a separate bowl beat the egg whites until soft peaks form. Whisk together the flour, baking powder, salt, and baking soda. Add to the butter mixture alternately with the yogurt and mix until well combined. Scrape down the bowl. Fold in the whipped egg whites, and when no white streaks remain, fold in the berries. Spread the batter evenly between the two cake pans and even out the tops with an offset spatula. Bake the cakes on the same oven shelf for about 25 minutes, or until the center springs back when touched and the edges are just starting to turn golden. Don't over bake. Let the cakes cool for 10 minutes before turning them out and cooling them completely on a rack. To make the frosting cream the butter, sugar, (and the drop of food coloring, if using) adding enough lemon juice to make a creamy spreadable frosting. Beat until smooth and creamy. Add more sugar for a stiffer frosting, and more lemon juice if it's too stiff. Frost the cake when completely cool. Add a generous amount of frosting to the first layer, then top with second layer and finish frosting top and sides.